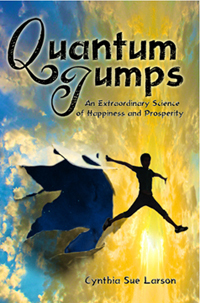 I am thrilled to announce that my new book, Quantum Jumps: An Extraordinary Science of Happiness and Prosperity has just been published! Quantum jumps presents a radical new paradigm: that we exist in an interconnected holographic multiverse in which we literally jump from one parallel universe to another. In a moment you can become smarter... more confident... happier... more outgoing... more effective... in better relationships... with more willpower. Gain practical tools to achieve real change in your life. Leap forward to become happier and more prosperous, living the life of your dreams. Supported by scientific research, Quantum Jumps is an inspirational book backed with practical tools to help you live a happier, more prosperous life. My inspiration to write this book was based on finding a growing body of scientific evidence describing how we experience quantum phenomena in our everyday lives. From the field of quantum biology, studies indicate that plants are likely utilize quantum processing to account for their phenomenally efficient photosynthesis. Birds appear to be utilizing quantum abilities for navigation, and humans seem to be able to smell extremely minute quantities of things thanks to quantum behavior occurring on the macroscopic scale. The first quantum computers have been purchased and are now operating based on quantum bits, qubits, that can exist in a state of being True-and-False simultaneously. In the fields of psychology and medicine, meanwhile, evidence of the placebo effect, in which people improve their health, vision, test-taking abilities and more based upon mere suggestions, continues to grow. Explanations for what might be going on have been coming from the field of quantum astronomy, in which the presence of parallel universes is now being seen in "baby pictures" of our universe, with evidence appearing in the background radiation at the time of the Big Bang. Anyone who can relax, clear their mind, and envision being different in some way--such as more successful, funny, healthy, wealthy, or wise--can quantum jump. As American psychologist, William James, once said, "If you want a quality, act as if you already have it." Quantum Jumps includes an entire chapter of Quantum Jump Starts featuring 17 practical, scientifically-proven ways you can experience immediate improvements in your life. For more experienced reality shifters and quantum jumpers, the following chapter provides 17 more things you can do to further improve your life--by jumping into a new reality. Of the many wonderful quantum jump experiences described in Quantum Jumps, some of my personal favorites involve the seemingly simplest kinds of quantum jumps--such as research that shows how we get an immediate boost in energy by skipping, for example. This is based on research by Dutch behavioral psychologist Erik Peper, who encourages his students to, "get up and wiggle," every half hour or so. 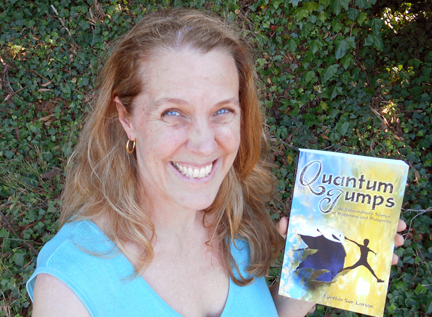 I'd love to see you when I come to Portland, Oregon and Seattle, Washington this month to give talks and offer intuitive consultations at the New Renaissance Bookshop in Portland and the East West Bookshop in Seattle, Washington... and please forward this email to friends who could use a quantum jump in their lives! We can stay in touch no matter where we are in the world: I share new experiences, tips, stories, and inspirational ideas at Facebook, Twitter and YouTube, and I look forward to seeing you there! 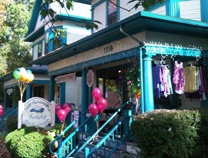 Intuitive Consultations with Cynthia in PORTLAND, OREGON! Intuitive life coach and best-selling author Cynthia Sue Larson can help you align yourself with your spiritual gifts and higher purpose for greater success and prosperity. Gain insights into your goals, visions, and personal and business relationships. Gain inspiration, a fresh sense of direction, and a boost of positive energy that has the power to shift your reality in a direction that helps you discover just how good your life can truly be. 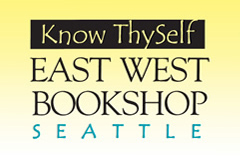 Intuitive Consultations with Cynthia Sue Larson in SEATTLE, WASHINGTON! ($50/30 min $100/60 Min) Intuitive life coach and best-selling author Cynthia Sue Larson can help you align yourself with your spiritual gifts and higher purpose for greater success and prosperity. Gain insights into your goals, visions, and personal and business relationships. Gain inspiration, a fresh sense of direction, and a boost of positive energy that has the power to shift your reality in a direction that helps you discover just how good your life can truly be. Welcome to the shadows where the love of history, a good story, legends and lore meet with a passion for the paranormal! And there are plenty of paranormal aspects to explore in the realm of reality shifts in this exciting interview with Cynthia Sue Larson. Getting to the heart of the question "What is consciousness?" has the power to change our lives. Humanity is leaving the Information Age at a time of environmental, economic, and political challenges--poised at the threshold of the Age of Heart. This new heart-based, cooperative, transparent, decentralized, value-based society depends upon a more complete understanding of consciousness. Best-selling authors Eva Herr (Consciousness) and Cynthia Sue Larson (Reality Shifts) share new ideas from the fields of quantum physics and quantum biology, with insights as to how we can prosper and thrive amidst this time of great change and uncertainty. I first experienced a reality shift a good long while after Back to the Future came out, some time after the TV series Quantum Leap ended but before the film Sliding Doors came out. I am particularly interested in the points where metaphysical and mainstream cross over, and perhaps it's because of this that I did interpret the incident as the shadow of an alternate reality. The incident was a brush with death, which is why it was so profound, and my memory is as fresh as if it happened last week. What happened was that I was about to cross a busy city street, not at a designated crossing as is the way in London. I had done the usual cursory check over the shoulder, half glancing half listening out for vehicles, and was about to step off the pavement, when a bus came thundering past as if out of nowhere. A fraction of a second later, and I would have been in its path. What made this experience stick in my mind was that I felt and heard a phantom blow to my cheekbone, as if I had been struck by the bus. While I did think of it as an alternate reality, I took it as just one of those strange things twixt heaven and earth. It did not occur to me that it might be possible to achieve a reality shift with intent. I have lived in London (England) all of my adult life, always in the inner areas as I love the buzz of city life. I still visit the street where the incident happened, though not as often as I now live a couple miles away. At the time, I was young, free and single so my weekly shop would consist of a couple of hours browsing pretty things, fun things, interesting things and tasty things, sometimes buying items, sometimes not. At that time of my life, I was not consciously practicing meditation but I have always loved to walk and it is a meditative experience for me. When I walk, I tend to sift memories of the past, observations of my surroundings and dreams of the future. I am very much in my head (am having to work on being more grounded, actually) but at the same time present enough in my surroundings to be safe. Apart from a handful of years in the country as a teenager, I have spent my formative years in big cities. Even as a young child, from 7 or 8 I had a lot of independence, walking the family dog alone, visiting my friends and traveling to school on my own. (In those days, all children did so and there was safety in numbers). This early autonomy enabled me to develop a heightened road awareness, and yes I do experience premonitions. The most recent was only a couple of months ago, actually, one weekday morning. I was on my way back from taking my dogs for their early morning walk. The traffic was heavy and stationary by the time we got to our zebra crossing, which is right after a bend in the road. Zebra crossings give pedestrians right of way (eg, http://www.examiner.com/images/blog/EXID4732/images/abbey-road.jpg) and are signposted by two big yellow beacons on tall poles. There was a big coach paused right before the zebra lines. I had a bit of a 'bad' feeling, but was in quite a rush, as I was running late for work. So across we went, and lo and behold a cyclist came pelting round the outside of the coach. Luckily for us, though not for him, he managed to avoid both me and the dogs but got tangled in the leads and came crashing down. This kind of accident can get a bit road ragey in London, but we both just looked at each other dazed, mutually apologised (him for colliding with us, me for dropping a couple of four-letter words!! ), checked we were all OK, shook hands and went on our ways. The brush with death experience though, was not premonitory. I am convinced there was an alternate reality where I stepped into the road and connected with the bus. In the reality which left me alive, the bus passed before I stepped out. I don't know where the microsecond delay that 'saved' me occurred. Maybe I had paused to light a cigarette (an addiction I have long since shifted away from!) along the way? Maybe I had fiddled with the zip on my coat? No idea! But it did feel like both realities were running at the same time. It didn't feel like a re-run, a chance to change an outcome, which was the concept of the Quantum Leap series. My experience was more like Sliding Doors. NB it definitely happened before that film came out; I wasn't living in that area by 1998. Have you heard of people with memories of holiday date changes like me? Several years ago, in my reality, Thanksgiving changed from the 3rd Thursday of the month to the 4th Thursday of the month. There are people out there who also remember 3rd Thursday Thanksgivings. We must have shifted into this reality where it is celebrated on the 4th Thursday and always has been. Note from Cynthia: I have heard of date shifts, such as the "Tuesday that never was," and years that went remarkably fast (almost as if someone were teleported through them with filler memories), but not specifically about holiday dates shifting. This might well be a rather common occurrence. Yesterday I went in my library to get Black Elk Speaks. I know the shelf I keep it on, and it was gone. I searched every book and every room of my house. After an hour of searching I gave up. Today I was cleaning the living room and brought two books into my library to put them away. I put them in my Native American section and there was my missing book, Black Elk Speaks, right where I searched for it yesterday! I had touched each book on the shelf with my finger, to make sure I didn't miss one, and I did this over and over again. I know for absolute certainty that book disappeared for a day. I have thousands of books and Black Elk Speaks is the most valuable book that I own. I feel Black Elk's presence when I read it, which is so often half of the pages are loose. I love my old, falling-apart, highlighted and marked up copy. It is priceless to me. I was looking for my book Black Elk Speaks so I could reread his account of White Buffalo Woman. It's very short and I have read it many times. When I got my book back there was one line I had no memory of ever reading: "With this you shall multiply and be a good nation." Black Elk is saying White Buffalo Woman's pipe was given to the Chief so their tribe could multiply! I was very astonished at this. I did a Google search on that quote and pulled up many, many quotes on this line. If it was not there before (which I'm certain it was not) then how come there are so many people out there are quoting it? Other than that one line (which said something else... I can't remember the original version) my book looks exactly the same. Note from Cynthia: That's so interesting about the story of White Buffalo Calf Woman and the pipe, as I also have no recollection of any such statement as, "With this you shall multiply and be a good nation." Your experience with your "Black Elk Speaks" book vanishing and reappearing reminds me of how some of my favorite books at times have done something similar. On one memorable occasion, a book I'd felt frustrated with didn't exactly vanish and reappear so much as completely transform from an example of an author who had little confidence in his ideas to a book in which the author had tremendous charisma and passion that really came through. Three years ago I was in Las Vegas with my son and his wife. We rode the casino elevator up to the top floor where my car was parked in the garage. We stepped out of the elevator into another reality. The building was flipped into its mirror image. My car was not there. We got back in the elevator, rode it down to the bottom and back up to the top and stepped out into our own reality. My car was right where I parked it next to the elevator. When the Casino flipped to its mirror image we were all headed back to our Hay House convention. I was worried we might be late for our next session before the door even opened and we found ourselves in an alternate world. We walked around in the flipped reality for a while, looking for my car. My son and his wife were freaked out. I wasn't at all disturbed. My reality had flipped before. I once saw the entire town of Twin Falls flip to its mirror image. I was amazed at how upset they were. It made me realize I live in a different world than most people. I know I am the reason we entered an alternate reality and they were pulled into it because they were with me. I suggested we get back in the elevator (and yes it was the same one we rode up there) and ride it all the way down and up again. It worked--we were back. William and Jenny were wondering what would have happened if we had not made it back. Would they be living someplace else? Could they find their lives in that world? What else would be different? I have never entertained such thoughts when things change. I know my life will continue without such problems. Note from Cynthia: Wow! What a truly astonishing experience to have in Las Vegas, looking for your car! Thanks for mentioning that you've witnessed topographies flip more than once--this is a type of reality shift I've not yet personally witnessed (that I can recall). I know some casinos are so big with so many elevators, some people might simply assume you first came up in a different elevator and found everything mirror-image reversed... but the way you describe this experience, it sounds like you simply went up to the correct level for your car, got out and looked around, took the same elevator down and then back up again... and voila! Your car was where you expected to find it. My personal objects--phone, glasses, purse, waste basket, desk items, books, etc. move around, disappear and reappear. My glasses disappeared for two weeks and then reappeared right where I left them. My waste basket disappeared for three months and then returned where I had put it. Other objects move from room to room. People's faces change, and I mean drastically. I see a dozen different Charles (my husband) and they are nothing alike. They have different facial bone structures and different personalities. I know a few other people who have faces that change. I never before asked myself when did Charlie's face start to change? Thinking back I have no memory of his face changing before we got married. We dated for four years and I never noticed him looking different. I knew someone at that time who's face did change. This is not a new concept to me. I'm sure I would have noticed if Charlie's face was changing while dating. I had a lot of uncertainty over whether I should marry him. We developed a friendship and I had a caring type love for him, but I knew friendship, love and money was not enough for a good marriage. Parts of me had doubts, other parts did not. I suspect one reason I am a reality shifter is because I have alter-egos. Perhaps our marriage created many more worlds where different me(s) split off at that moment. Note from Cynthia: The times I've most often heard reports of reality shifts involving people's personalities and faces have involved people traveling internationally for several days or weeks, and then returning to notice differences. Noticing your husband's face changing after you got married is very interesting, as it seems to suggest your worldview may have opened substantially following your marriage. My job is an accountant at a large corporation. Although I usually work out of my home office, I'm sometimes required to make an appearance in the office. I was working there this past week. It's a very large open space with high ceilings. I noticed that there were 5 pillars/columns that I had never paid attention to before. BINGO! In the largest font I could print, I printed-- HOW GOOD CAN IT GET? I printed each word separately twice and attached them to the pillars on both sides. Now whenever anyone walks into that space from either direction, that is the message they see! That is so awesome! Thank you so very much for doing this, and for sharing it with me! been doing investigation on the location of Sri Lanka, nine out of ten persons said they recall the country further southwards from India, and not adjacent to the southeastern flank as it currently appears; one person had the memory concurrent with present reality. All of them are gents aged between 30 to 50, and all of their memories date back to more than 15 years ago. How's that for a clincher? In fact, I am more intrigued with the one discrepancy than with the nine anomalies. Wow, thanks so much for sharing your survey results so far on this interesting topic! I am also intrigued about the one discrepancy. Fascinating! THE JOY OF STRATEGY provides readers with the necessary tools to think strategically about how best to create an enjoyable life. Allison Rimm's practical words of advice provide clarity, insight, and inspiration at just the right moments. This book is the perfect gift for the person who has everything--yet feels a sense something is still missing, or that there's just not enough time for what really matters. As someone who's led corporate workshops on planning and decision-making, I recognize THE JOY OF STRATEGY as an essential toolbox anyone can use to recreate their life from the top down, starting with what truly matters most. One of the most common mistakes most people make is to get caught up in reactionary mode, fighting each little fire as it comes up, without feeling an overall sense of living true to one's highest ideals or providing service to the world in ways that only you can ever do. Allison Rimm's book brilliantly provides the most important factors to keep in mind, one at a time, enabling readers to benefit from learning to think as strategically as the most productive companies, all the while keeping an emphasis on rediscovering true joy and happiness in life. Highly recommended! 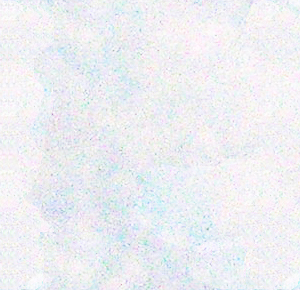 Over 7,200 RealityShifters Subscribers live in 84 different countries around the world -- with the majority in the United States of America, Canada, the United Kingdom, Australia, Africa, New Zealand, India, the Netherlands, Malaysia, Mexico, Italy, Sweden, Germany, Brazil, Belgium, Singapore, South Africa, the Philippines, Japan, Norway, Ireland, Denmark, Spain, Israel, and Panama.